Developing strong community citizens for the future. 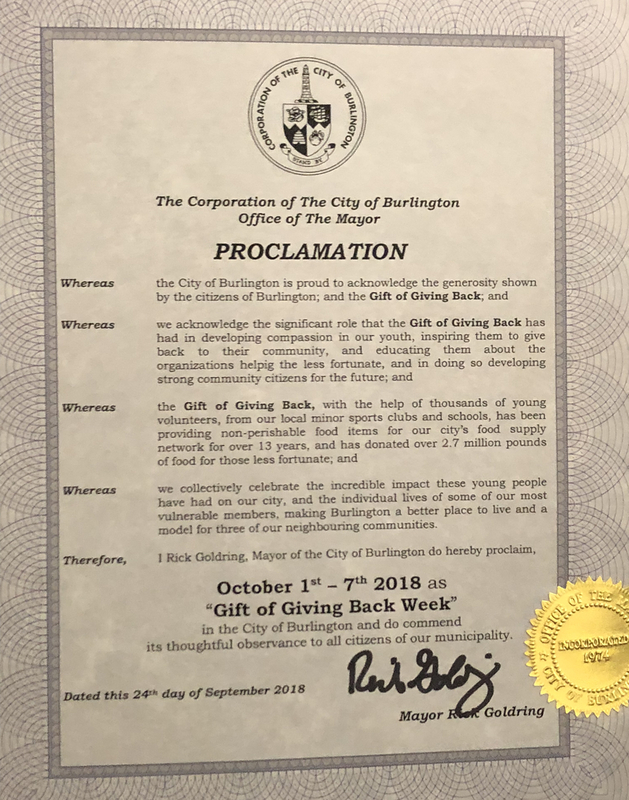 BURLINGTON – As part of The Gift of Giving Back Week 2018, scheduled for October 1 - October 7, 2018, The Gift of Giving Back is engaged with youth in minor athletics organizations across the City inspiring them to give back to their community, and educating them about the our beneficiaries which help the less fortunate. “We collectively celebrate the incredible impact these young people have had on our City, and the individual lives of some of our most vulnerable members, making Burlington a better place to live,” said Mayor Rick Goldring. 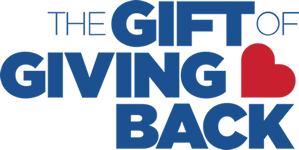 The Gift of Giving Back will be hosting the collection of food with the beneficiaries in the Gymnasium at Robert Bateman High School during the evenings of November 6-7, 2018. 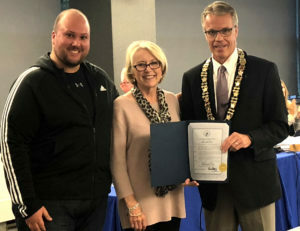 “When you see our kids in the community, whether it be in your neighbourhood with our now iconic blue bags, or at your local grocery store tagging - please show the compassion in your heart and give generously,” said Chair Jean Longfield. 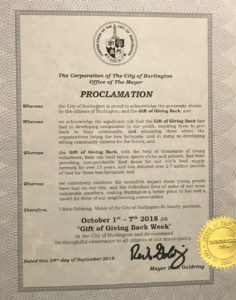 The Gift of Giving Back Week kicks off with our flag raising at Burlington City Hall in Civic Square at 10am on Monday, October 1, 2018. As the largest community food drive of its kind in Canada, The Gift of Giving Back has raised over 2.6 million pounds of food across the participating communities; which has a direct benefit of over $6.6 million*. * Food Banks Canada 2017 Annual Report; "Nielsen MarketTrack, All Channels, 52 Weeks, Ending December 15, 2014". Market value of donated food weight at $5.50/kg. Converted to $2.494756/lb.